To keep up with all this and effectively monitor these cloud-based applications and dynamic infrastructure, monitoring platforms need to change as well. Relying on legacy on-premise or single-tenant, managed hosting (aka “SaaS look-alikes”) monitoring solutions for your dynamic infrastructure and cloud-hosted applications is like driving a go-kart on the Autobahn—you just can’t keep up. When a customer buys something online, the process generates a number of HTTP requests. For proper end-to-end cloud monitoring, you need to see the exact set of HTTP requests the customer makes while completing the purchase: each of the individual product-detail pages, the add-to-cart POST requests, the cart view page, the billing and shipping POST requests, and the final “Submit Order” page. The ability to capture the raw transaction data is particularly important in cloud deployments, where requests often go through a number of dynamic components—from a browser or mobile device to a CDN followed by a load balancer—before reaching the application and the microservices and queues involved in completing the transaction. Being able to quickly identify bottlenecks and understand the relationships between different components in cloud-native systems is a huge differentiator. With New Relic you can see the exact response time of each component for each transaction, not just the aggregate metrics associated with those transactions. That way, when a customer calls support to ask why they got an error when checking out, you (or your support or DevOps team) can actually find the exact set of transactions, across all of the New Relic-managed tiers of your application stack, that caused the error. When companies move to the cloud, it’s no longer all about one big monolithic app talking to a database server. Instead, you have to worry about problems cropping up in increasingly complex connections among an ever-growing number of components, including load balancers, queues, serverless architectures, apps, microservices, and more. When it comes to cloud monitoring, it’s important that your transaction traces connect all of the pieces together. It’s also important that you have deep language agents delivering a profound understanding of internal application code to deliver critical, insightful data to the individual components themselves. With almost a decade of experience, New Relic supports seven languages out of the box, with no manual configuration or code changes required. 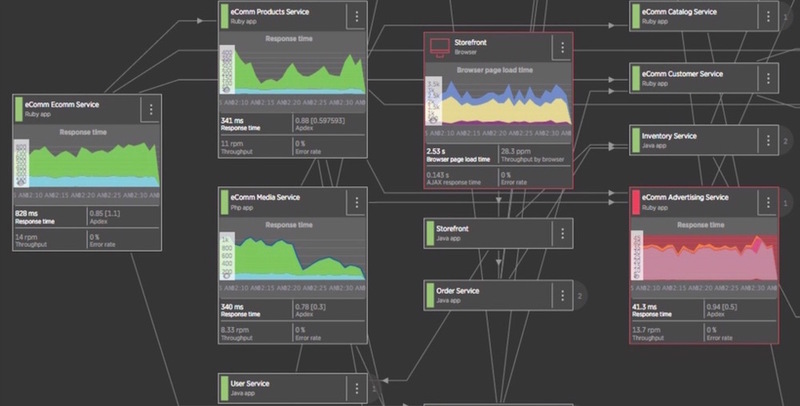 In addition, New Relic APM service maps provide an essential visual representation of the connections between components, allowing you to track a performance issue across all touchpoints. Once you’ve identified an issue, trace data lets you identify the associated code that is causing it, which allows you to fix things faster. And our innovative new Health Map visualization integrates our industry-leading APM and infrastructure monitoring data to help ops and DevOps teams better understand and troubleshoot their applications. Most important, New Relic goes beyond just the connection between the application server and the infrastructure; it also shows you how client-side performance across mobile and browser applications directly impact the customer experience. As mentioned above, web developers are now heavily dependent on the end user’s client. As a result, the backend doesn’t always tell the whole story. Sometimes when your application server looks fine, your client is actually failing over and erroring out. New Relic Browser, New Relic Mobile, and New Relic Synthetics make the New Relic platform one of the only solutions that actually captures the entire end-to-end performance story. New Relic service maps show connections and dependencies between applications and services calling one another, and display deep performance data about each node. When dealing with cloud-based apps and infrastructure, you need the ability to monitor a wide variety of cloud provider integrations in one place. You don’t want to have to download and install different plugins for each AWS (or other cloud provider) service. With New Relic Infrastructure, you can monitor all the supported AWS integrations in one place. That’s just one reason we call New Relic a “true SaaS monitoring platform.” AWS integrations’ support for leading services—like Elastic Load Balancer (ELB), EC2, ElastiCache, and many more—is built into New Relic Infrastructure, so all it takes is a single-line configuration change to monitor any supported AWS integration. With dedicated teams responsible for development and support of cloud integrations, we don’t have to rely on community-created plugins for cloud integrations; the creation, care, and feeding for these integrations is entirely owned by New Relic. Additionally, all the data available via these cloud integrations is captured in New Relic Insights and ready for users to analyze with the click of a button. Why should you care about this? Because you’re likely using tons of services from cloud providers, and we don’t want to make you build your own integrations with those services just to understand the health of your applications and infrastructure. Native AWS integrations to popular services like Lambda, DynamoDB, RDS, Cloudfront, and more are available with New Relic Infrastructure Pro. Host-based pricing for monitoring solutions developed for on-premise installations may not properly accommodate the reality of dynamic cloud architectures, where servers and containers come and go like the wind. In order to leverage a cloud monitoring solution, you need to ensure that the pricing model for that solution actually works with the ephemeral nature of cloud platforms. In the cloud, you don’t have time to grow your monitoring solution to cope with increased scale. While old-style ops managers kept spreadsheets of serial numbers of their servers, load balancers, and other elements, that simply won’t work in a dynamic cloud environment. It’s both onerous and costly to set up and scale an on-premise controller to deal with vastly increased loads that may come at unpredictable times. With a dynamic cloud infrastructure, you no longer think in terms of a single instance as a lovingly curated pet—instead you have thousands of servers and you need to see all of them very quickly, while still being able to hone in on an individual one when necessary. Just as important, a cloud monitoring platform must be constantly available—from outages to periods of high load, it still has to keep collecting data so you always know what’s going on. Your cloud monitoring system is as critical as your most critical systems. With New Relic, you don’t have to worry about scaling your monitoring solution to cope with your biggest day of the year. New Relic is designed to provide real-time dynamic views across the entirety of your stack, no matter how it grows and changes. For example, instead of using spreadsheets to manually update how well your website’s product pages are meeting their SLAs for a weekly report, you can build a dashboard once and get real-time information whenever you need it. The benefits of a true multi-tenant Software-as-a-Service architecture go far beyond not having to buy servers to scale your monitoring. A true SaaS solution such as New Relic is designed to help you avoid the worry, hassle, and expense of maintaining, updating, and managing dedicated infrastructure just to monitor your apps. Instead of forcing you to install patches and upgrades like some single-tenant hosted solutions, we automatically roll out our innovations to our users. In addition, NRDB is a real-time datastore that enables schemaless, index-less searching of raw data. That kind of system requires years of experience to scale and effectively run—being handed an ElasticSearch cluster and saying “have fun” won’t cut it. Because New Relic is true SaaS, you don’t have to worry about scaling out some non-relational database and services for querying raw data. Send the data to New Relic and let us deal with it for you. On-premise monitoring solutions are not well suited for advanced server-side transformation and predictive analysis of data, precisely because they are not multi-tenant. In a multi-tenant environment you can create highly diverse points of comparison and benchmark across thousands of customers instead of isolating the data into silos. This isn’t practical in a single-tenant on-premise or managed-host environment. Similarly, on-premise solution providers typically have very little control over the data itself, which makes it hard for them to fine-tune and improve algorithms or predictive analysis in real time. As a 100% SaaS vendor, New Relic is uniquely positioned to do useful and valuable things with the data our customers send us. Our platform demonstration of Project Seymour, for example, leverages artificial intelligence to proactively discover when things may be going wrong in your websites and apps. This intelligence takes full advantage of the volume of data and compute power within NRDB, and we expect this will continue to be a key differentiator for New Relic’s platform. At the end of the day, you want to focus your teams on building great software, not on scaling your monitoring. To do that you need a monitoring vendor who gives you the latest and greatest without making you worry about updating on-premise infrastructure and data collectors, and who can truly connect the dots from the client all the way down to the infrastructure serving up your applications. The New Relic platform is built to scale automatically with your dynamic infrastructure and applications deployed in the cloud. As a true multi-tenant SaaS solution with native cloud integrations, the ability to capture raw data (in addition to aggregate metrics), deep language agents, and cloud-aware pricing, New Relic offers a complete and easy-to-use cloud performance monitoring platform for your digital business.